Show girls how to properly brush their teeth. Ask a dentist come to a meeting or go on a tour to a dentist office to teach your girls oral hygiene. Teach girls the importance of washing their hands before meals and after using the bathroom. Remind girls not to share combs, brushes, clips and hats. Keeping hair brushed helps girls look their best. By now girls know about brushing teeth but might want to learn about mouthwash. Try some experiments with hand washing to see if they are washing their hands properly. Ask girls to rub a little oil on their hands then sprinkle with cinnamon (to represent germs). Ask girls wash without soap and see how the ‘germs’ don’t come off. 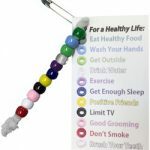 Ask girls wash with soap for 20 seconds (sing the Happy Birthday song twice) to see the importance of soap and the length of time needed to get rid of germs. Make your hygiene lesson fun by having them try different hairstyles. 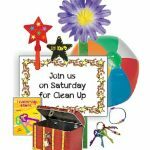 Remind them to use their own combs, brushes and hair accessories. Discuss the importance of regular shower and shampoo. The girls need to get ready to take care of their own health needs including being able to make appointments for physical and dental check ups. Encourage girls to talk to their parents about letting them make the call for their next health and dental check ups. Talk to the girls about deodorant and antiperspirant. Help them learn about the difference and which one is right for them. 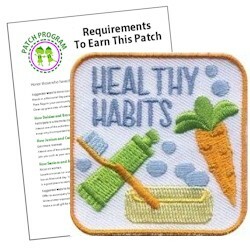 1 review for "Healthy Habits Patch Program"